D- Style Medical ID Bracelet with wide chain and pink emblem. 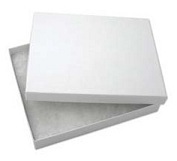 White gift box (3.5" x 3.5 x 1") is made of chipboard and are covered with a white swirl paper. They come filled with two non-tarnishing polyester fiber pads to protect your finest jewelry and other small gift items.